Walking in a light drizzle rain is pleasing. It is more fun to have your pet dog along with you on such occasions. A good Rain Coat keeps your pet away from moisture and mud during rainy seasons. Rain Coats also reduces the chance of your dog catching a cold. At PetsWorld, we stock premium branded Rain Coats for dogs of all sizes. Short haired dog breeds are quite vulnerable to the cold which can make them uncomfortable. The Rain Coats keep them warm during such weather. 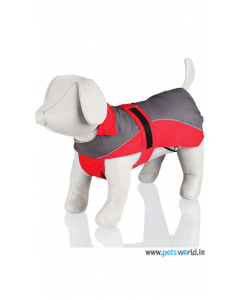 The Rain Coats you will get at PetsWorld also eliminate the wet dog smell that lingers around your house during the rainy season. Furthermore, the Rain Coats have Reflective pipes which makes the motorists travelling down the road easily see your pets. Trixie Lorient Rain Coats provided by PetsWorld is fabricated out of high-quality Polyester and are absolutely wear and scratch resistant. The bib and roll-up hood protect your pet dog’s head from becoming wet during a walk in the rain.